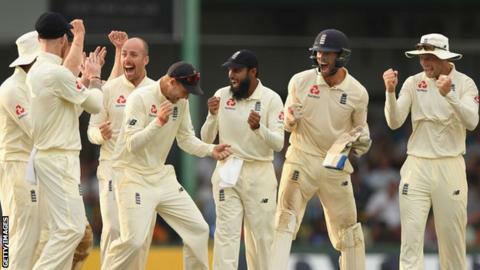 England moved a step closer to a first series whitewash in Sri Lanka after punishing their sloppy hosts on day three of the third Test in Colombo. The tourists fell to 39-4, but Jos Buttler hit a calm 64 as England posted 230 to set Sri Lanka 327 to win. The home side closed on 53-4, still needing another 274 runs, after Moeen Ali struck twice and Jack Leach and Ben Stokes claimed one wicket each. England have an unassailable 2-0 lead in the three-match series. Unless Sri Lanka pull off an unlikely highest successful chase at the Sinhalese Sports Club, England will win every Test in a series on the island for the first time. They will also become only the third side after India this year and Australia in 2004 to win 3-0 in Sri Lanka. Having lost their last nine wickets for 67 runs in their first innings, with eight batsmen falling after tea on day two, Sri Lanka once again capitulated in the evening session. Moeen drew Danushka Gunathilaka forward on a good length and the ball spun sharply to take the edge and fly through to Stokes at first slip as the hosts slipped to 15-1. Dhananjaya de Silva then fell lbw for a duck as Jack Leach got one to straighten just enough, with England successfully overturning on review. A bottom edge saw Dimuth Karunaratne reverse an lbw decision after he was initially given out, but the opener, who top-scored with 83 in the first innings, was bowled five balls later without adding to his 23 when Moeen skidded it on with the arm. Although spin was doing plenty of damage, Stokes had vexed Sri Lanka with short, quick bowling on day two and Root shrewdly brought the all-rounder into the attack as the light faded and it started to rain. And with Stuart Broad positioned three-quarters of the way to the mid-wicket fence, Angelo Mathews fell into the trap, miscuing a hook for Broad to run in and take a fine diving catch. Buttler has passed 50 seven times in 10 Tests since his recall against Pakistan in May, scoring 760 runs at an average of 44.70. A thrilling, destructive batsman in one-day cricket, the most valuable qualities he brings to the Test team are his measured approach and versatility. England were in trouble at 39-4, leading by 135, when Buttler arrived at the crease. Keaton Jennings was dismissed lbw off the first ball of the day from Dilruwan Perera, who snared Rory Burns in the same manner soon after. Jonny Bairstow clipped Dilurwan to substitute fielder Kaushal Silva at short leg before Joe Root chipped back to Malinda Pushpakumara and suddenly Sri Lanka had a chance. But Buttler adapted. Appreciating the extra bounce here compared to Pallekele, he used the sweep shot sparingly and played straight, also advancing down the pitch to keep finding the gaps for singles – he hit just three fours but maintained a strike rate of 80. Having successfully overturned an lbw decision on 27, Buttler eventually ran past a ball that spun down leg from Lakshan Sandakan and was stumped by Niroshan Dickwella, but his stands of 89 with Stokes (42) and 40 with Moeen (22) had put England back in control. Dilruwan, who finished with figures of 5-88, bowled superbly to run through England’s top order, finding turn and variable bounce, but Sri Lanka let the game slip away with a series of mistakes. The worst offender was Sandakan, who had Stokes caught at cover and first slip on 22 and 32 respectively only for replays to show the spinner had overstepped on both occasions – two of many no-balls that were missed by the on-field umpires. Stand-in captain Suranga Lakmal, who also bowled only three overs, showed little tactical nous in keeping a spread field throughout. It may have limited England to just 11 fours but they were still able to easily score at more than three runs an over. Moeen benefitted to play himself in before he nicked a lifting delivery from Sandakan for Dhananjaya to take a superb low catch at first slip and leave England 171-7. But Foakes and Adil Rashid calmly added to England’s lead in a stand of 44, both able to nudge singles freely. Even once Rashid flicked one off his glove to be caught behind for 24 and Broad nicked to short leg soon after, Foakes added 15 frustrating runs for the last wicket before Leach edged Dilruwan to Dickwella. The Smith problem – how can England dismiss the best batsman in the world?